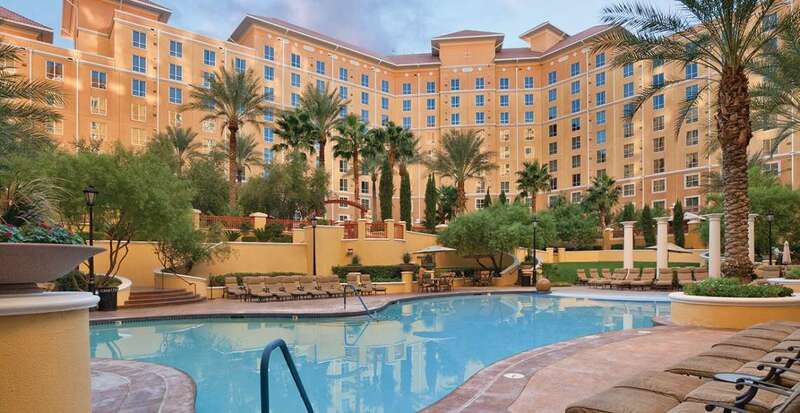 The Mediterranean-style, Wyndham Grand Desert mega resort has three towers that allow for beautiful mountain, dramatic Las Vegas and charming courtyard view of the lagoon-style pool. This smoke-free hotel features 3 outdoor pools, a fitness center, and a poolside bar. Free WiFi in public areas, free self parking, and a free area shuttle are also provided. Additionally, 2 coffee shops/cafés, a spa tub, and a sauna are onsite. All 787 rooms feature kitchens with refrigerators and microwaves, plus free WiFi and TVs with cable channels. Other amenities available to guests include sofa beds, living rooms, and dining areas.